The latest source version can be downloaded at footprintbuilder-0.5.zip, or as a pre-compiled version at footprintbuilder.jar. 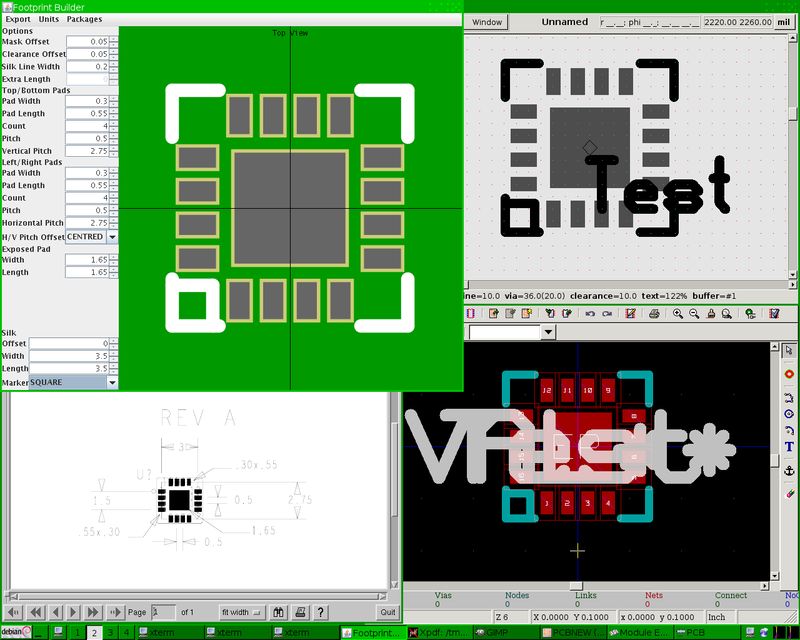 This sheetshot shows how footprintbuilder was used to create a footprint for an Analog Devices component, and the results loaded into pcb and kicad. First select a unit from the Units menu. Then select the package type from the Packages menu. Then you can use the various spinners and comboboxs to design the footprint. To export a file select the option from the Export menu. footprintbuilder - An interactive footprint design tool for EDA tools. importation into their chosen EDA tool. supporting any EDA tool which has a documented file formats. version of the JDK, the build environment requires Apache Ant (1.7).